You’ve bought a new kayak and found appropriate-sized paddles for you. All equipment taken care of, you’re all set to head out for a kayaking adventure you’ve looked forward to for months. There’s one thing you may be forgetting, though: do you know how to transport a kayak? On any longer kayaking excursion, you’ll most likely have to carry out so-called “portages”. 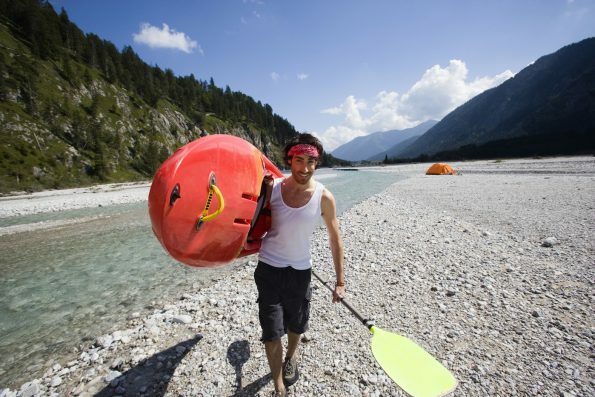 In addition, you obviously also need to transport your kayak to and from your starting and ending points. 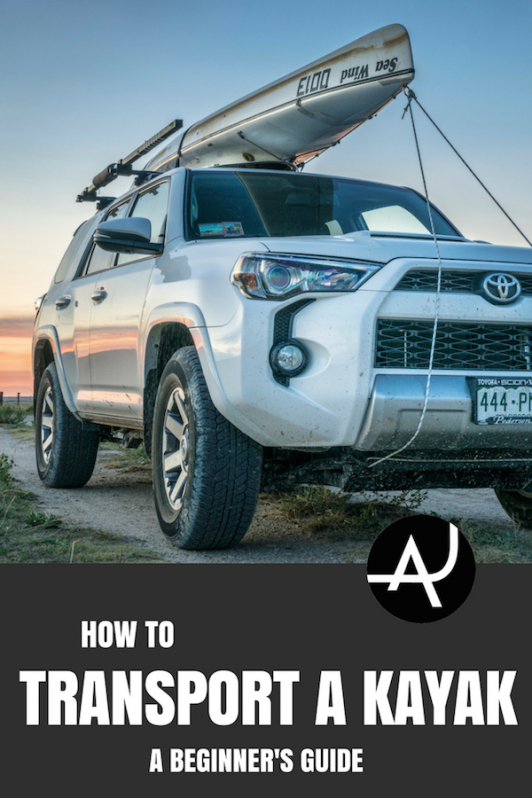 As outdoor experts, we here at The Adventure Junkies are ready and able to give you some solid advice on how to transport a kayak safely, comfortably and conveniently. 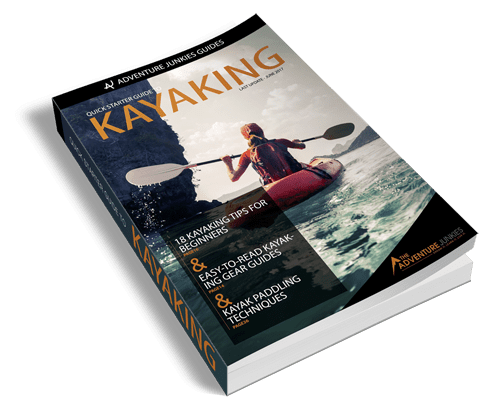 In this article, you’ll find tips and tricks that will help to make your kayaking adventure a memorable success. When talking about how to transport a kayak, you will probably think only about transporting it with a vehicle. That seems the most difficult thing, doesn’t it? 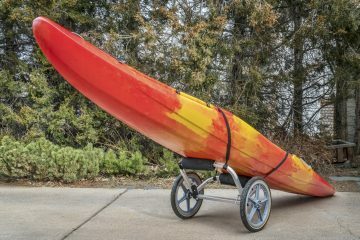 Much of what follows will teach you how to transport a kayak with a vehicle, but we’ll also discuss some tips on carrying your kayak by hand. The easiest way to transport a kayak is, of course, throwing it in the back of a pickup truck and securing it with some ropes. Everyone can do that. A bit trickier, however, is figuring out how to transport a kayak on top of a vehicle. This is what most people will have to do and what we’ll talk about below. To transport a kayak on top of a car, you’ll need some kind of rack system on your car’s roof. Removable soft racks are a good option because they’re easy to set up and can be removed. This system is nothing more than a pair of foam tubes with a strap through each tube’s center. Open all four doors, place one tube above the front doors and one above the back doors. Run the straps through the doors and tighten them. Close the doors. Then, place your kayak upside down on the tubes, securing it with the rest of the available straps. 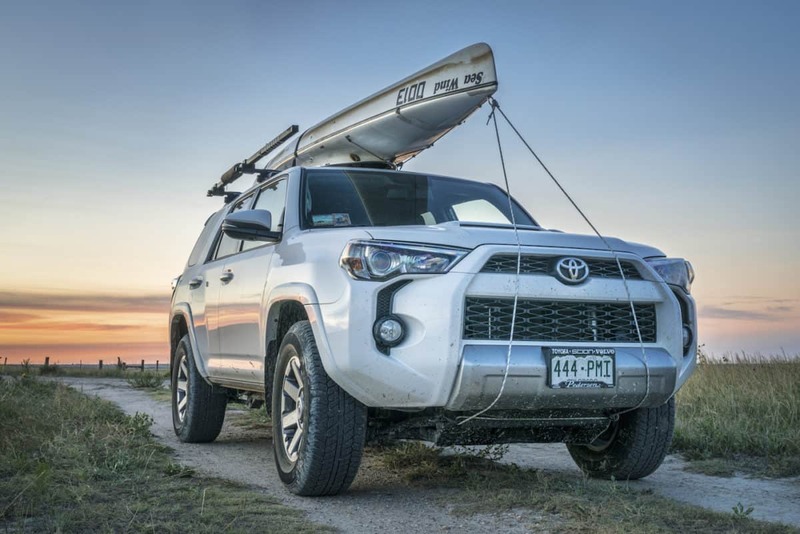 Make absolutely sure to secure your kayak’s bow and stern to your front and rear bumpers respectively. This system is simple but tends to have some flex. You’ll want some extra security. This is an ideal system for short trips. For longer car trips, you’ll want a proper roof rack consisting of mounted crossbars. There are two manufacturers that make reliable roof racks: Thule and Yakima. They both make excellent racks that you can put on your car. They also offer a wide range of add-ons for their crossbars. This makes those racks suitable for everything from bicycles and suitcases to kayaks and canoes. While your kayak should be placed upside down on foam tube racks, its position on actual roof racks depends on each individual rack. Follow their instructions. The best way to strap down a kayak on your car’s roof is to slowly tighten the straps. Don’t just yank them down, but be gentle. You don’t want to crack your kayak’s hull by pulling too hard on the straps. When placing the kayak on the roof, make sure it’s totally parallel with your car. As REI.com tells us, center it fore and aft. Using at least two straps, secure your kayak’s body. Then, secure the bow and stern to your car’s bumpers. For this, you can use a simple tie-down strap or buy a specially made bow/stern tie-down set. It’s also worth considering locking your kayak to your rack. This is particularly useful if you’ll go somewhere where you won’t be able to see your car. You don’t want it to be stolen! 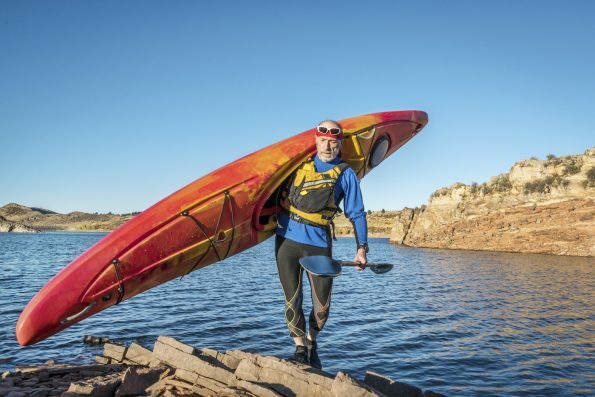 Carrying your kayak by hand is known as portaging. This is necessary to simply get your kayak to and from the water’s edge, but also on longer kayaking excursions. For example, when you’re following a river, you may encounter unavoidable obstacles. 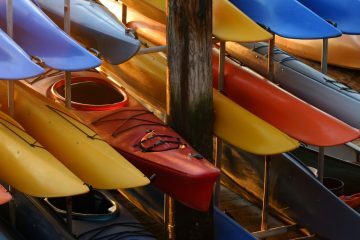 You may also have to transport your kayak between different bodies of water, such as rivers and lakes. It could be necessary to get out of the water to avoid dangerous rapids or areas that are simply too shallow to kayak in. Portaging is nothing more than carrying your kayak overland to a point where it’s safe and/or possible to get back into the water. When you know that you’ll have to do some portaging during your trip—and you should know!—, make sure to bring a backpack. It’s essential that you can fit all your gear into that backpack. Before starting the portage, remove all your gear from your kayak and put it in your backpack. 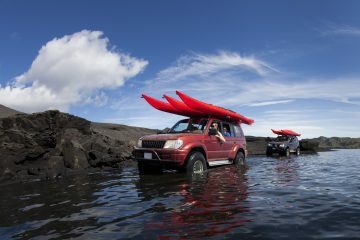 When doing this, make sure your kayak is far enough on land. You don’t want it to float away as it gets lighter. Put your backpack on and secure all of its straps. Ensure that it fits well and is comfortable. Then, squat down to keep your center of gravity close to the ground. Pick up your kayak by placing your hands over the cockpit coaming and lifting it over your head. Your kayak will now be upside down. Hold the kayak so that its weight is balanced over your shoulders. Your head should be where the cockpit is. Make sure the kayak is tilted a bit backward. 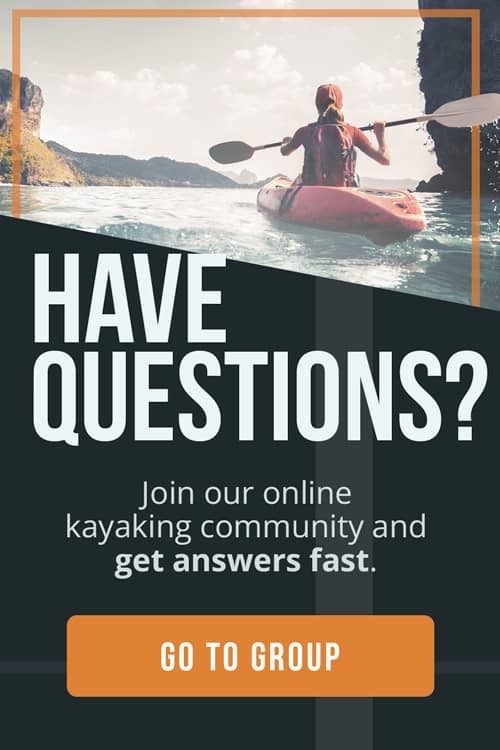 Trails.com says that, when portaging, you can rest one hand at a time by resting one side of your kayak on your shoulder, switching from hand to hand and shoulder to shoulder as you go along. Depending on the length of the portage, you’ll have the rest at regular intervals. How often and how long you take a break, of course, depends on how strong and fit you are. The best advice we can give you is to take your time. Don’t overexert yourself. You do not want to jeopardize the rest of your kayaking adventure by trying to prove yourself during a portage. Take it easy.